Do You Consciously Cultivate Community? Lately, the idea of community, what one needs from it, what one contributes to it, and how to create it have been on my mind a lot. There have been such huge shifts in my life in the last few years, with many things still in flux, my sense of community must also shift. More now than ever, I’m conscious of who is in my life and why and I’m purposefully asking, ‘Who are the people that make up my various communities? Who do I want in my life? With whom do I want to work? Play? Live? Worship?’ I’ve reached the age and stage of my life where I don’t want to rely on the happy accident. Life can be serendipitous, it’s true, but I also think consciously choosing with whom I spend my time and share my experiences is worth a little extra time and effort. 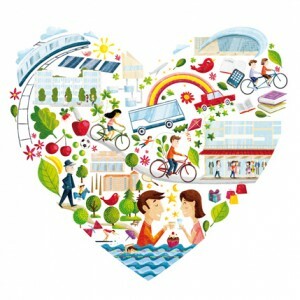 If your community doesn't nurture your heart, isn't it time to consciously look at who and what makes up your community? Merriam-Webster defines community broadly—it’s both a group of individuals joined by common interest and the society at large … and several definitions in between. Family is often our first community, whether by birth or design and it’s there we start to understand what works or doesn’t for us. We begin to recognize need versus want and find the comfortable place in the middle. Outside our immediate family we often find those who most resonate with us, but this can change as we do. Most of us end up with a small community of intimate friends and a larger community of casual friends. Then there are the acquaintances and colleagues that might make up our professional community and many of us also have a spiritual community to which we belong. Some of these groups and individuals may overlap, but for others there won’t be any mixing at all. And some of these groups seem to naturally evolve in a way that makes it seem as if we have no control over their makeup. But, I think we have choices. My life has gone through some radical changes in the last few years and as I look at what I’m working toward and what I want to manifest in my life professionally and personally, it has me seriously contemplating on how to consciously cultivate the communities that will support and help sustain those desires. Motivational speaker, Jim Rohn, said, “You are the average of the five people you spend the most time with.” That was an eye opener, but it makes sense to me; I realize I need to be pretty picky about with whom I’m spending my time. I think we ALL need to ask ourselves, ‘Are the people with whom I surround myself supporting me? Positively challenging me? Are they ambitious? Are they caring and generous? Will they offer me emotional/mental/physical support as I learn, grow, and develop both personally and professionally? Are they people I can support similarly?’ Asking these questions and honestly looking at the answers will bring a consciousness to how we cultivate community in our lives. It’s not always easy, of course. Sometimes this consciousness means we need to sever relationships because misery loves miserable company. 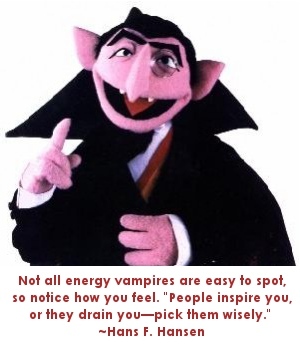 If there is someone in your life who is a vampire (not the sparkly or Spike-like blood-sucking variety, but rather the one who drains all your energy every time you spend time together) that person needs to go. If you turn to someone for feedback and you’re never given anything but the dark view of things, that person needs to go. Creative, positive challenge is a good thing; it keeps us sharp and learning. But if all you’re met with is competition and one-upmanship, how does that help either of you? If someone turns every discussion into an argument, determined to drill the fact there’s only one way to look at something, then that person needs to go. All that being said, I am NOT suggesting you ditch the friend who’s going through a rough patch—we all have those times in our lives. But you need to watch for a pattern—is the negativity and energy drain a temporary rough patch or actually that person’s normal? If negativity is a person’s permanent way of being, and if you can’t have a positive effect on that person or that person is unwilling to work on him or herself, ask for help, or change things, does it make sense to allow yourself to be pulled down, too? No, it really doesn’t. So, notice who leaves you feeling drained after interacting. Who’s call are you reluctant to take? With whom do you keep delaying plans? Those are the folks you need to consciously look at; the fact that sometimes these negative folks have faces we’ve known for years and are people who’ve long held a place in one of our communities becomes irrelevant when we look at the bigger picture. Day to day life can be challenging enough without turning your quest to move forward, learn, and grow into a daily battle. So, with as much love and compassion as I can summon, I intend to continue consciously choosing how I cultivate community. I want to interact with people with are willing to learn from each other, offer support during good and difficult times, share experiences, nurture connections, and in general help all of us keep growing and expanding in our minds and hearts. How about you? How do you define community and where do you feel a sense of it? Do you consciously make choices about who to let into your life or who must go? Deb, thanks so much for writing on a topic that everyone feels but few articulate. Well, articulate effectively anyway. I’m inclined to gather lots of new people and then attempt to cultivate. I’ve made enough “book by the cover mistakes” that I try to keep an open mind. Despite what I feel is my keen insight and instinct I realize that some major people in my life would not be here if I had followed my initial lead. That said, I do a fair amount of cutting as well; just not with the same ease that I might have done before. Thanks, Ed. Glad this was thought-provoking for you. We can’t be 100% right on every time, either. I also think that some people come into our lives at the right time and they are the right people, but they may not be meant to *stay* in our lives. It’s when we keep holding on that it becomes problematic and energy draining.